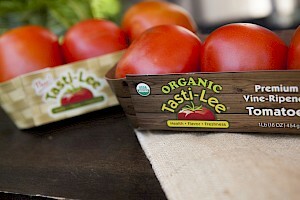 Tasti-Lee Organic Tomatoes is a HIT! These tomatoes are very tasty and according to the company have twice the amount of lycopene as other tomatoes - I just wish they would tell us how and why they do. These are non-GMO and organic. Because they are a fruit, they are not required to list nutritionals - but the average tomato, according to USDA which is 90 grams, or a little larger than these are 15 calories, no fat or sodium with 2 grams of naturally occurring sugars and one gram of protein. What I really like is that the core of the tomato is slightly larger and makes slicing or chopping a breeze.